Spice Up Your Life With Cumin! You walk into an Indian restaurant and your nose catches whiffs of the fragrant aromas emanating from the kitchen. While multiple spices have co-mingled to create a pleasing sensory experience, one spice in the mix is undoubtedly cumin. 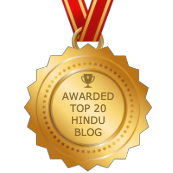 According to Ayurveda, each food has at least one of six tastes or rasas: sweet, sour, salty, bitter, pungent, and astringent. We require each taste in our diet. Cumin is bitter and slightly pungent. It decreases Vata and Kapha doshas and increases Pitta dosha if taken in high doses. In Sanskrit, Cumin is known as jiraka. Jira means “that which helps digestion”. Ayurveda considers jiraka as one of the best digestive tonics. Some of the Ayurvedic health benefits of cumin are that it dispels gas, eliminates toxins, is a mild laxative, and is anti-inflammatory. Because it’s so easily digested and so effective in expelling gas from the stomach and the intestines, it’s used for chronic dysentery and diarrhea. Cumin kindles the gastric fire or the agni and improves the absorption of minerals in the intestines. Scientific research has found that cumin may stimulate the secretion of pancreatic enzymes, which are key factors in proper digestion and nutrient assimilation. The spice’s digestive stimulating properties are attributable to its content of volatile oils. 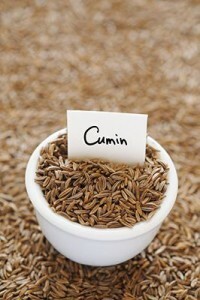 Just the smell of cumin starts enhancing digestion. The smell activates salivary glands. The compound Thymol is found in cumin, and it activates the pancreas to secrete digestive enzymes, as well as bile, to stimulate digestion. Quite often, gas is caused when food is digested slowly or incompletely. In these instances, food ferments in the stomach and thus produces gas. 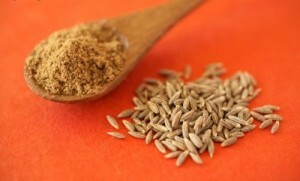 Cumin seeds, whose scientific name is Cuminum cyminum, are also a very good source of iron. Additionally, jira has anti-oxidant properties to protect the body from free radicals. When roasted, the powder be used for ulcerative colitis, diverticulitis, and chronic malabsorption. 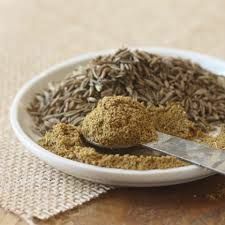 Cumin is an anti-dote to morning sickness. Nursing mothers find that this spice is lactogenic, increasing the flow of mother’s milk. Cumin oil is effective against eczema. For stomach pain, make a mixture of 1/3 teaspoon of cumin powder, a pinch of asafetida powder (hing), and a pinch of mineral mineral salt. Mix and chew well. Then follow with warm water. Cumin has long been used for its medicinal properties. Studies also show that cumin seeds may contain anti-cancer properties. It was shown to protect from the development of stomach or liver tumors. This effect may be attributable to this healing spice’s strong free-radical scavenging abilities, along with its capacity to enhance the liver’s detoxification enzymes. Furthermore, a recent study has found that this spice has the ability to enhance memory and relieve stress. 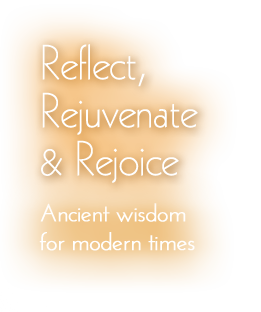 Please consult your health care practitioner or medical professional for advice on how to best incorporate natural healing modalities into your life. Stock up on cumin seeds or powder, enhance your health, and spice up your life!